Rebecca tells us about her collaboration with Daum to re-create versions of her sculptures in glass, and gives us an insight into what students can learn in the Foundry. The specialist technicians who manage Camberwell’s resource centres offer invaluable skills and knowledge to students across all courses. Whilst working at the College many maintain their own creative practice as artists and designers. Rebecca Stevenson is Camberwell’s Foundry Technician who assists students’ with ambitious castings in a wide range of materials. Rebecca is also a practicing sculptor and over the last year has been working on a collaboration with French crystal glass studios Daum to re-create and edition versions of her sculptures in glass. Daum were founded in 1878 and quickly established a reputation within the Art Nouveau movement centred around Nancy in northern France. They have a long history of collaborating with artists and designers including Salvador Dali and Philippe Starck, and are masters of the “pâte de cristal” method of glass casting. I was contacted by Daum early last year after their creative director discovered my work online. I was very excited at the prospect of working with them, not only because of Daum’s prestige and reputation, but because I could instantly see a strong correlation between my work and theirs. Daum’s innovative use of colour, translucency, and floral and animal motifs are also all important elements of my works in wax and polyester resin. There is also a parallel between the processes of foundry casting (bronze casting) and “pâte de cristal”, as both are ‘lost wax’ methods. The first stage of the process was to select two of my existing pieces to use as a starting point. I made prototypes in plaster and resin in my studio and sent these to Daum, along with some of my existing moulds. A few weeks later I visited Daum’s workshop in Nancy and spent a fascinating few days working hands-on alongside their fantastically skilled artisans, adapting my prototypes to make them suitable for glass production. This was an amazing experience and I not only learned about technical aspects of glass casting but also picked up all kinds of tips and ideas for mouldmaking and modelling, discussed approaches and materials, and improved my French vocabulary! Coming from a fine art background, it was also interesting to meet and talk with Daum’s marketing specialists – we had to make decisions based not only on aesthetics but also on production times, costs and the requirements of the market – all important to get right for the project to be commercially viable. After my visit, Daum’s modellers continued to refine the prototypes until we were all happy with the results. The process of making test casts in glass then began. Daum tests every piece they produce in order to perfect the mould design and also the shade and depth of the colour. Everything is meticulously recorded so that once a perfect cast has been achieved, it can be reproduced as an edition. 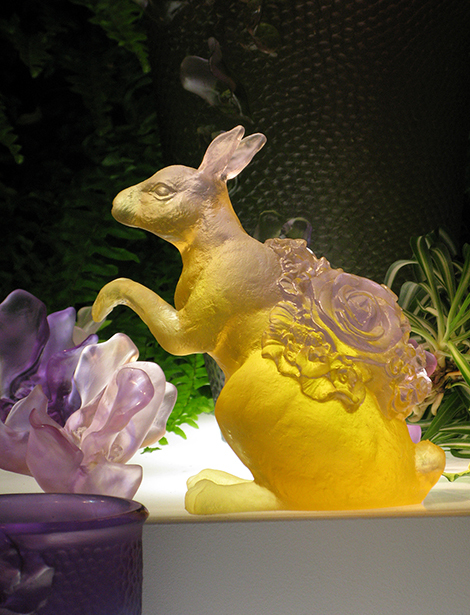 You recently exhibited your first piece from this collaboration, ‘Wonderland Rabbit’, at ‘Maison et Objet’, Paris. Could you tell us a bit more about this piece and what you have planned next? The ‘Wonderland Rabbit’, was launched as part of Daum’s new collection ‘Jardin Imaginaire’ at Maison et Objet Paris, Europe’s largest interior design trade fair. 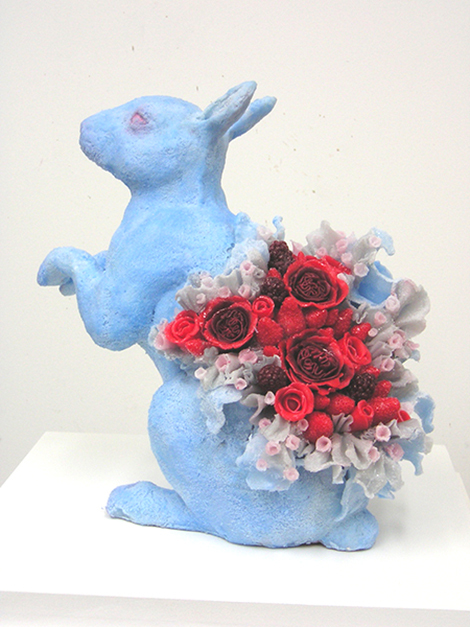 The decorative opening in the back of the rabbit, filled with roses and fruit, is characteristic of my sculpture. The yellow glass was created especially for this piece by Daum’s resident chemist. There will be an edition of 375 ‘Wonderland Rabbits’ which will be sold via Daum’s own boutiques and other high-end retailers worldwide. The second piece will be launched later this year, at the moment it is a closely guarded secret, but I can tell you that it’s going to be a lot larger and very spectacular. Students can learn a wide range of casting and mould making techniques including making plaster and rubber moulds, wax work, and casting into bronze and aluminium using the lost wax process. Some of the projects I’ve recently worked on with students include a bronze hoodie, trainers cast into plaster, turning cabbage leaves into bronze and aluminium dishes and making silicone rubber moulds from bodycasts to be cast in ice. How do you feel having your own creative practice influences your work here at Camberwell? Having my own practice complements and benefits my work here in many ways. When I’m making my own work, I’m constantly improving my own knowledge and skills, plus I’m trying out new approaches or materials which I can then pass on to students. Being actively involved in making work makes it easier for me to relate to the challenges that students go through when trying to realise a project. I don’t see my relationship with students as a ‘me and them’ thing – we are all practitioners engaged in developing and realising our work, improving our knowledge and solving problems along the way, we are just at different stages in our careers.